On July 28, 1999, in Miramar, Florida, 12-year-old Lionel Tate decided to practice some of the wrestling moves he had seen his strutting idol, Dwayne "The Rock" Johnson, perform on his favorite television show, WWF Smackdown. Lionel, who weighed 170 pounds at the time, demonstrated some pro-wrestling techniques with 6-year-old, forty-eight pound Tiffany Eunick, with the result that she was punched, thrown, kicked and stomped to death. On the coroner's report, the cause of Tiffany's death is listed as "blunt force trauma." Lionel Tate, who has a reputation as a schoolyard bully, injured her little body to the extent that she bled from her mouth, nose, eyes and ears. Her skull was fractured in several places and her ribs were cracked. Part of her brain was flattened inside her head. The beating Lionel Tate gave her was so severe, part of Tiffany's liver broke loose and was floating free inside her body. The thought of being one of Tiffany's parents and having to make that identification at the morgue -- looking down at the brokenness, the dried blood, the horrible bruising on her arms, face and torso and knowing that the lifeless shell lying there on the gurney was your daughter, your baby -- is one that could make any parent's blood turn to ice. Every natural urge that a parent has to shelter, protect and defend would suffer from an impotent, inconsolable grief. Lionel's mother, Florida state trooper Kathleen Grossett-Tate, claims that her son was just "playing" with Tiffany and that her death was the result of a "tragic accident." On January 26, Ms. Grossett-Tate added that she couldn't believe it when the Broward County Circuit Court jury in her son's trial in for Tiffany's murder returned a guilty verdict after three hours of deliberation. She was certain they'd acquit him. After the guilty verdict was handed down from the circuit court, Lionel Tate's case went before Judge Joel T. Lazarus for sentencing. Lionel Tate was tried as an adult under a Florida law which does not require him to have had the actual intent to kill to be convicted of first-degree murder. "He didn't have to say 'I'm going to kill Tiffany Eunick,'" said prosecutor Ken Padowitz. "All that is required is that he intended to act, not that he intended the result." Defense attorney Jim Lewis never argued that Lionel Tate did not kill Tiffany Eunick; Lewis's defense was based upon the boy's love of professional wrestling, which depicts (scripted and choreographed) acts of extreme violence. In essence, Lewis stated that it was not Lionel's fault that Tiffany was killed -- it was the fault of the World Wrestling Federation. Lionel Tate should be pitied and not punished. There is plenty of evidence to suggest that Lionel Tate was responsible -- completely responsible -- for his actions and also that he knew what he had done was wrong. For instance, when the police came arrest Tate, he protested that all he'd done was give Tiffany a bear hug. Later, he confessed that he had attempted to throw her onto a couch, but missed and instead threw her into the banister of the stairs. As he was pressured to tell his whole story, more horrors were revealed, which could lead one to think that this "schoolyard bully" knew his level of violence had been way over the top all along. Judge Joel Lazarus evidently was thinking of this when he refused to reduce Lionel Tate's first-degree murder conviction to a lesser charge. He was also undoubtedly thinking of the media blitz arranged by Lionel's lawyer and mother, who appeared in a non-stop whirl of morning news-talk shows and press conferences, all designed to organize an outpouring of sympathy for Lionel. 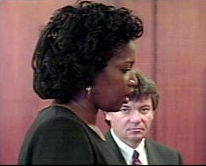 Attorney Jim Lewis and Kathleen Gossett-Tate were so certain that their message of "oops -- it was all a sad accident" would find favor with the public and Judge Lazarus that they summarily rejected a plea bargain agreement offered by prosecutor Ken Padowitz that would have had Lionel serving only three years of jail time plus ten years of probation. Lewis and Gossett-Tate actually believed that Lionel, with his history of bullying other children, would be completely exonerated of any blame surrounding the circumstances of Tiffany Eunick's death. His intent when he stomped on her ribcage, you understand, was to "play" with her. It was much to their surprise when Judge Lazarus treated them -- the mommy, the lawyer and the bully -- to a forty-five minute tongue lashing in which he excoriated them for their separate roles in completely trivializing a human life. Tiffany who? Wasn't she that annoying little screamer with the blood leaking out of her eyes? The judge then handed down Florida's mandatory sentence for those who are convicted of first-degree murder: life in prison without parole. "The evidence of Lionel Tate's guilt is clear, obvious and indisputable," said the judge from his Fort Lauderdale courtroom. "That evidence supports the jury's verdict." For the record, I dislike the idea of a fourteen-year old being given a sentence of that breadth, but on the other hand, I think that the plea bargain of three years' jail time is disgraceful: Tiffany is completely gone from this world, forever. Where is the justice in allowing Lionel Tate to continue his life after only three years of punishment? There must be some sort of middle ground between these two extremes. I also think it is completely outrageous that his lawyer and his doting mama insisted that Lionel shouldn't have to spend any time in jail. "How do you tell a child 'you're going to prison for the rest of your life for playing'?" Gossett-Tate asked. "I want my son out. He should not be there!" I have the strong feeling that I can point to the exact reason why Lionel Tate earned his reputation as a playground bully. Mothers like this one are as much as a menace to society as the evil spawn they raise to prey on the rest of us. In her arrogant selfishness, Kathleen Gossett-Tate seems to be oblivious to the fact that Tiffany Eunick's parents undoubtedly wish that she weren't in her grave. There doesn't seem to be anything in Gossett-Tate's code of ethics that would deter the strong from hurting the weak -- and she's a state police officer! I find it frightening that a person in the position of protecting the public could have raised such a child. Jim Lewis is appealing for clemency to Florida governor Jeb Bush to see if Lionel Tate's sentence can be commuted to a lesser prison term. Pending that hearing, Governor Bush has ordered that Lionel be housed in a juvenile lock-up. Some might even think that this could be considered protective custody to keep him away from his own mother, the person who has both loved him and failed him the most. Shelley McKinney is a senior writer for Enter Stage Right.